I’m most proud of teaching practice #8, my last lesson. I prepared for the lesson by talking to students at break time, to get a feel for their interests, what problems they have with English and why they are learning English. Almost all the students I talked to either had plans to go to America in the near future, or wanted to go someday. They all wanted to know how people get jobs and start businesses in America. I thought of doing a lesson on resume writing or interviewing, but one of the other trainees had already made a lesson about that, so I chose a current event from the Bangkok Post about getting work in America. I could not find a single newspaper article that was perfect for the lesson. I wanted something that would give them good practice reading and be interesting, and also give them enough information for a group speaking activity at the end of class. Most stories were either too complicated, using lots of hard words, or too short and simple, lacking the detail needed for making a discussion work. I’ll summarize the article in a few sentences: Foreign student workers signed up for a special temporary work visa program with Hershey Chocolate company. They worked over the summer in exchange for a living wage and some travel money to have a cultural exchange in America. These workers ended up protesting because they said their wage was too low and they were being mistreated. Hershey fought back and threatened to deport them – the US government finally opened an investigation. In the end I edited together about 4 different newspaper articles and simplified the language, leaving only a few difficult vocabulary words that we could work on in class. I’ve printed the full article and my lesson plan for it below. I also included examples of the handouts I used for activities. 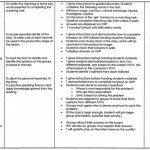 Below is a gallery of my actual lesson plan and handouts used for the lesson, followed by the article I cobbled together. 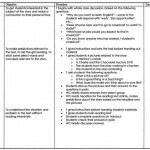 Guided discovery: An activity for students to find the meaning of key vocabulary in the reading on their own. They work in pairs to complete the handout, then we check answers as a class. Scanning: These questions cover the key parts of the reading, students don’t need to understand everything in the article, but need to understand the key points to complete this. 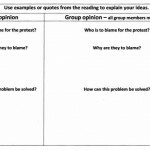 Group worksheet: I first had students write their own opinion about who to ‘blame’ for the problems in the article, Then I put them in groups of 4 – each group had to decide on 1 group to ‘blame’ and explain why on the board. It sounded like the perfect summer job. Over 400 students from China, Africa and Eastern Europe would work in a Hershey’s chocolate plant before using their earnings to traven the US and learn English. The students are among the more than 100,000 workers who come to the U.S. each year of popular J-1 visas, which supply businesses cheap seasonal labor as part of a program aimed at promoting cultural exchange. The students pay from $3000 – $6000 for the visa and to travel to the US. The visa allows them to work for three monts, and afterwards they can travel for one month to learn about the U.S. and its culture. 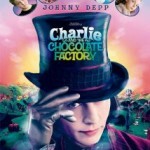 When they arrived at the factory, however, the students did not find chocolate waterfalls or endless treats like in the movie. They claim they were forced to work as “captive workers” trapped working long hours in the factory for low pay. Shifts, often at night, consisted of lighting dozens of heavy boxes, weighing 24 kilograms or more, and trying to control fast-moving production lines, they said. “They don’t care if you are small, you don’t have the power, you didn’t eat – they just care about their production,” one of the students said. The students walked out last week in protest of their conditions and pay. 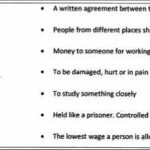 US law states the workers must recieve the federal minimum wage of $7.25 an hour for their work – about $290 per week. However after deductions and rent charges, the students were only earning $40 – $140 for 40 hours of work per week. The students could not put up with it anymore when they discovered they were paying more than double the rest of their neighbors. While the normal rent for the area is less than $200 per month, the company took $400 from each student’s pay. The students were hired through a non-profit company, “The Council for Educational Trust USA (CET USA), in San Clemente, California. CET USA has said the students signed contracts that describe the work they would do. “One of the complains students have raised is that it is hard work, but they should have understood the work they would be doing,” a representative for CET USA said. The student protests continue, and the US government Department of Labor has said they are considering investigating Hershey to find out if any laws were broken at the factory. The lesson went quite well, the students were interested by the story and had a lot to say about it during the discussion part of the lesson. I made four different groups, and as I had hoped each group chose a different party to blame for the problems mentioned in the story. One group, of course, blamed the company, siding with the protesters claims of unfair treatment and dishonest contracts. Another group blamed the student workers – saying that they were whining and should have understood the work required of them before paying the money and traveling across the world. The third group blamed the US government for lack of oversight of the program. And the last group made an interesting argument, blaming consumers for always demanding the absolute cheapest product, without caring about the working conditions.